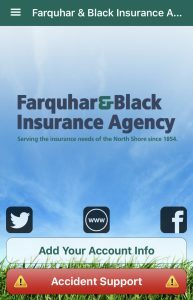 We have an app for that ⋆ Farquhar & Black Insurance Agency, Inc.
We live in a world when we can access anything right from our smartphone. Want to pay your babysitter but don’t have cash? You can Venmo her. Need to go food shopping but you have a sick baby at home? You can go on Instacart and it will delivered within hours. Want to schedule a doctors appointment? I mean the options are endless. So we have decided to jump on the band wagon and Farquhar and Black now has an app that is available for free for all iOS and Smartphones. Its so easy to find as well, just type in Farquhar and Black in the search! But what can our app do? Once you have your app installed, up and running lets walk you through what it can do! Because really when it comes to your car insurance and your home insurance our app is going to be able to help with the little things as well as the really big things! First lets go into what we offer on our app – When you open the main menu tab on the top left hand side we offer accident support, your insurance info, account information, contact your agent, road side services, home inventory, and accident history. Wow! How great is that. Many vacations still happen with the great American road trip. We all grew up that way and sometimes flying is was more expensive then packing up the car. But how often have you been driving on the highway and might now know where you are? It happens more often than not and especially if you are somewhere you aren’t familiar with. Lets do a quick scenario; you are driving on the highway and have to call 911 from your cell phone. You did not pay attention to the last exit because it wasn’t yours, do you know exactly where you are? I bet you don’t and thats okay. On our app we have an Assistance tab. You can call 911 right from out app. When the 911 operator comes on she is going to ask you your location because your calling from your cell phone. On the same page as you call calling 911, we also have a location service so you know exactly where you are. As I had mentioned about the main menu all the different options it offers, it offers a lot. Under the roadside assistance as well as repair shop, you can go in and store your company that use if you do break down on the side of the road or need a repair. Here you can simply add the name, phone number and an email address if they have one and keep it saved in the app. The next two options are the towing service as well as the gas station. These two will use our location service to find exactly where you are and pin point the closest gas station to you as well as where there is a tow company. 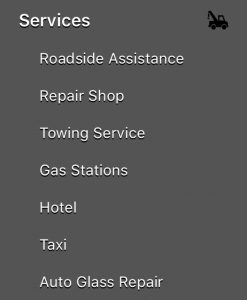 For the towing option once you click on the red flag the companies name and address will come up for you. The same options are going to work for the hotel and taxi option under the service tab as well. 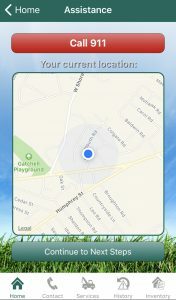 They app will locate where you are and tell you what is closest by you. If someone was to ask you to name all the items that you have in your home, could you? Off the top of your head, you could name a lot but definitely not everything. Especially if you are one of the unlucky ones that has your home broken into. Now of course any fine art, jewelry, and furs would be insured and scheduled so those items would already be on your insurance policy. On our app we have an option for you to list everything in your home. Its so simple. Open up the home inventory option in the main menu and follow the easy instructions. By clicking on the + button it will allow you add items. So by doing this it makes it easier to remember exactly what you may have in your home if an event may occur such as a fire or break in. 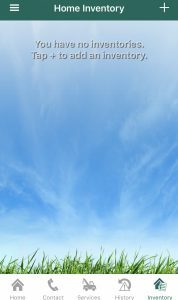 As a customer of Farquhar and Black we offer this app free of charge to you so you can keep us close by if you need anything car or home related, as well as a piece of mind. Previous Post: Water damage, is it covered? Next Post: Which type of home insurance do you need?